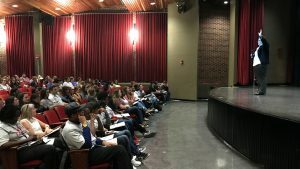 The Alabama Scholastic Press Association hosted the Tuscaloosa Fall Regional Workshop program on September 27th. 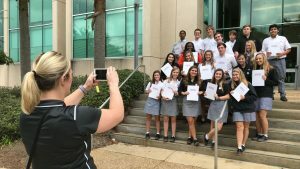 This workshop featured three sessions with topics covering broadcast, radio, photography, journalism and design for Alabama high school students. “ASPA is valuable to students because it gives them the training that they need to be successful, ethical journalists and communicators,” said Meredith Cummings, director of ASPA. The Regional Workshop capped off the 80th year of ASPA’s pursuit of journalistic excellence and facilitation of students to reach further through mentorship, workshops and programs. Similar workshops were also held in Huntsville and Mobile. ASPA honors journalism giants from across the state in order to highlight journalistic success to its students. ASPA tributes include Rick Bragg, Ed Mullins, Felicia Mason and more major players in the national journalism scene. These tributes work with students and encourage them on their path toward their careers. Cummings has a letter hanging in her office from 1942. It was written to Alabama principals to notify that ASPA would stop operation due to World War II, the only time ASPA has paused its work of empowering teachers and students across the state. The letter is a testament to the dedication of ASPA and the people who continue to carry its legacy. Each year, ASPA hosts the Long Weekend, a summer journalism camp, and a State Convention each spring. ASPA also produces the Multicultural Journalism Program, which seeks to increase diversity in American newsrooms, through summer camps, workshops, and providing mentoring for its students. Additionally, ASPA sponsors student writing workshops, awards scholarships and honors student journalists each year. ASPA’s mission is to stimulate and develop newspaper and journalistic talent among high school students. They develop and empower members to gain greater success year after year.